The following frequently asked questions cover broad interest about the Sherry Chen Legal Defense Fund and the civil lawsuit filed on January 18, 2019. They are not intended to be exhaustive. If there are additional questions, please send them to trustee@sherrychendefensefund.org. ​Q. What is the legal basis for the lawsuit? ​A. Sherry Chen alleges the government of malicious prosecution and false arrest under the Federal Tort Claims Act (See Rights and Resources for description of FTCA). ​Q. Where is the lawsuit filed? A. U.S. District Court for the Southern District of Ohio (See Rights and Resources about the U.S. judicial system). ​Q. Who are the lawyers for the Sherry Chen case? ​Q. Didn't Sherry already win her case? Q. Sherry must have done something wrong, didn't she? ​Q. Where can I find more information about the case? Q. Your message in Chinese is not accurate, why don't you say it [this way] instead? A. Chinese translation can sometimes be challenging. Please refer to the original version in English for more accurate message. Q. Why do you not use more Chinese translation in your messaging? Q. What [a specific person] did seems normal. She/He did not do anything wrong, did she/he? Q. Why do you decide to change legal counsels? Q. Is there a short version of the Sherry Chen story? ​A. The Sherry Chen Legal Defense Fund website provides a long version and a short version of Sherry Chen's 6-year ordeal. The long version can be found in About Sherry. The short version is located at Timeline. Q. How can I keep up with the developments? How can I help? A. This Sherry Chen Legal Defense Fund website (See Home) will provide continuing coverage of background and the latest developments. Sign up for occasional email updates and/or join a WeChat support group (See The Fund), which also provides suggestions on how you can help. Q. There is confusion about the MSPB decison being 135 pages or 120 pages long. Which is it? A. The MSPB decision is 135 page long and the judge's opinion is 120 pages long. The entire 135-page MSPB decision is posted by the Fund on the MSPB Decision, where there are a lot of details about Sherry's ordeal, and the actions of various government officials and agents. ​Q. What does it mean when Sherry wins her lawsuit? A. When Sherry wins her civil lawsuit, it will mean that the government is held accountable for its abuse and misuse of authority. We hope that the government will also recognize that its racial profiling policy and practices against innocent Chinese American scientists are legally and morally wrong. The United States is still a nation ruled by law. Upon winning the lawsuit, Sherry Chen will donate portion of the damage awards to the community and other victims of racial profiling. Q. What is the cost of Sherry Chen’s civil lawsuit? A. There is wide variation in the estimated cost of a civil lawsuit because the process is complex and dependent on many factors. For example, a lawsuit may be dismissed or settled early or go through a lengthy and contentious trial. The flowchart to the right provides a simplified description of what will happen next in Sherry Chen’s lawsuit. Sherry Chen's legal team will work on a contingency basis, meaning there is no direct legal fees. However, there will be legal costs from filing the case to discovery and the use of expert witnesses. If the lawsuit runs the full course, the most recent estimate of legal cost is up to $180,000 with a wide margin of error and the costs will likely be spread over time. Q: How does the Sherry Chen Legal Defense Fund operate? A: The law firm Arent Fox LLP set up a Trust Agreement and established The Sherry Chen Legal Defense Fund in 2015. Under the Trust Agreement, a Trustee is appointed to receive donations and support Sherry Chen’s continuing fight to defend herself and seek fairness and justice. Q: How does the Fund manage its finances? A: Revenues for The Fund have been donations and interest earned from bank accounts. Donations may be made by check or online. No cash is accepted for its general lack of a reliable audit trail. Donations represent 99.99% of the Fund’s revenue to date. Expenses for The Fund have been (a) legal fees such as billable attorney hours, (b) pass-through legal costs such as travel and transcript costs, and (c) service costs such as website hosting services and PayPal fees. Since its creation in 2015 through the end of 2018, legal fees covered 89.5% of the Fund’s expenses, legal costs 8.2%, and service costs 2.2% (please note that PayPal charges a 3.2% fee for a $100 donation. The PayPal rate varies by donation amount). Total may not add up to 100% due to rounding. The Trustee, Treasurer, and Chief Information Officer for The Fund are volunteers; they do not receive salary or any form of compensation for their services. ​Q: Sherry Chen’s case is a symbol for the Chinese American community. How is the Fund accountable to the donors for its finances? Please contact the Trustee at trustee@sheerychendefensefund.org for additional information. Q: Will the Fund consider additional lawsuits? A: The short answer is yes. We would leave no stone unturned and hold responsible parties accountable. ​Sherry Chen has had and continues to have excellent lawyers through her criminal, employment, and the current FTCA cases. They excel at what they do and they have done great work by winning all the cases so far. However, litigation is costly in the U.S. It requires understanding of how the U.S. government works. A lawsuit must have a solid legal basis, a reasonable chance of winning, sufficient facts and evidence, and dedicated funding of at least six figures to support the proceedings, even if there are well-qualified, experienced and reputable attorneys who would take a case on a pro bono basis. Finally, a written complaint, such as this one for the current FTCA lawsuit, must be filed to just begin the process. To take action short of meeting these conditions may negatively impact Sherry Chen’s current cases. Please contact the Trustee at trustee@sheerychendefensefund.org for additional information. ​Q. Why don’t you ask CAPAC for help? A. CAPAC stands for Congressional Asian Pacific American Caucus. Less than 2 weeks after the New York Times reported the Sherry Chen story, CAPAC convened a press conference on Capitol Hill on May 21, 2015 to express its concerns about Sherry’s case and racial profiling. On the same day, Professor Xiaoxing Xi was arrested and accused of spying for China. His case was also dismissed later that year. CAPAC has maintained its unwavering support for Sherry Chen and other profiling victims and stayed in regular contact with concerned community organizations over the past four years. We suggest you contact CAPAC executive director Krystal Ka’ai directly to express your concerns about Sherry’s case and racial profiling in general. Community voices help to strengthen CAPAC’s position in Congress. Please visit apajustice.org for additional information. Each U.S. citizen is represented by two senators (https://www.senate.gov/senators/index.htm) and one representative (https://www.house.gov/representatives/find-your-representative) in Congress. They are public officials expecting to hear from their constituents about their concerns. You can also help by telling Sherry’s story to your senator and representative, family, friends, neighbors, and colleagues, as well as making a donation. Q. How does a lawsuit work? 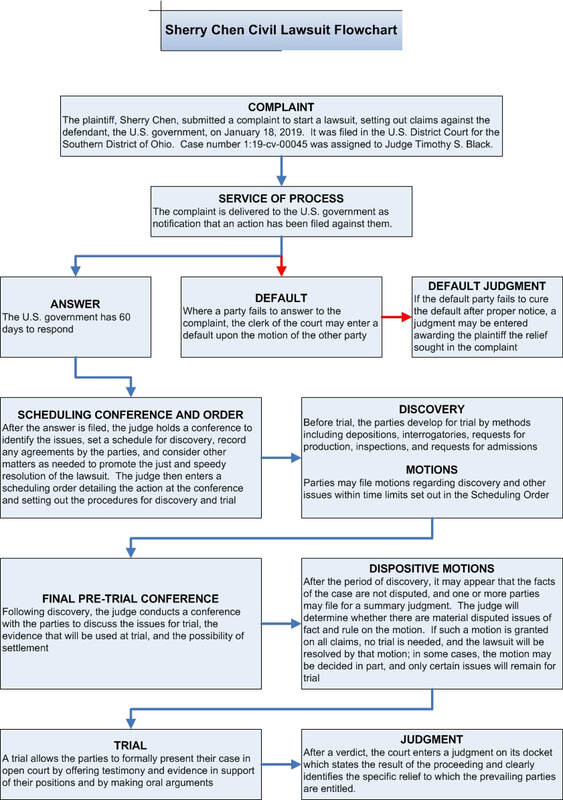 What are the basic steps in the civil litigation process? ​A. The Sherry Chen Legal Defense Fund does not offer legal advice or assistance. In addition to the flowchart given above, there are many publicly available sources to answer this question. One example is provided by Stoel Rives LLP (no relation to the Fund) at https://www.stoel.com/how-does-a-lawsuit-work-basic-steps-in.